Attention: UniForm-PC should not be confused with UniForm, also from MicroSolutions. There are a total of 16 different UniForm versions, each running on a specific CP/M computer. See brochure below! 2.17: No manual availiable on the internet!? 3.0X: No manual availiable on the internet!? Version 2.0X still has the command line parameters described in the manual. Version 2.1X does not provide these anymore. 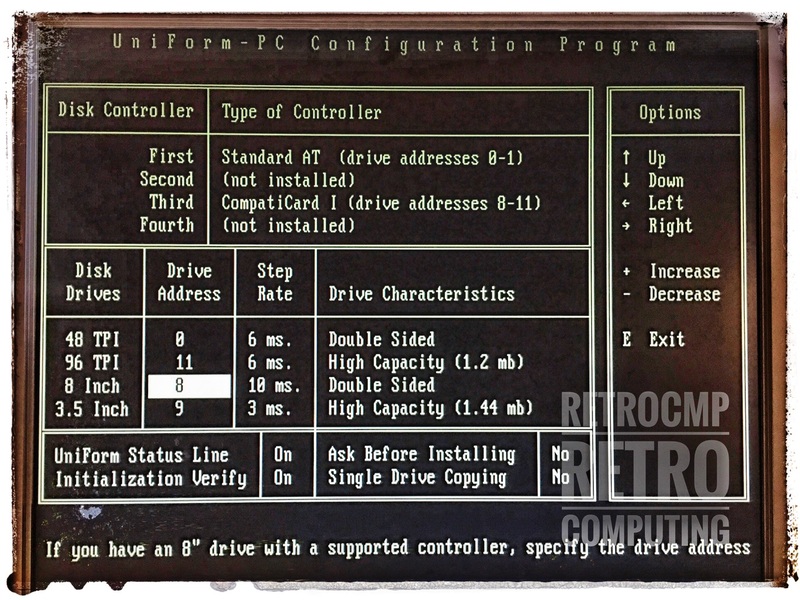 In this version you have to select the floppy controller(s) explicitly. On the one hand this is an advantage, but on the other hand you lose some freedom. For example, if you don't have a CompatiCard (CC), you can't select the option "Single Density SD", although your floppy controller can write FM formats. It's a big disadvantage! From version 2.1X on you can select the four possible floppy disk controllers very easily via the configuration program. For me, for example, the CompatiCard I is installed as the third controller with a total of three floppy disk drives. Note on the side: In my series about the CompatiCard I use another configuration. But! You can NOT select the CompatiCard IV in IniForm 2.1x, because it came out later. Does anybody of you use the CompatiCard IV (CC4) together with UniForm (CP/M)? Note the CompatiCard IV, not the CompatiCard I (CC1) or CompatiCard II (CC2). The CC1 runs fine with UniForm-PC 2.17. But! UniForm-PC 2.17 does not support the CC4, only the CC1 and CC2. 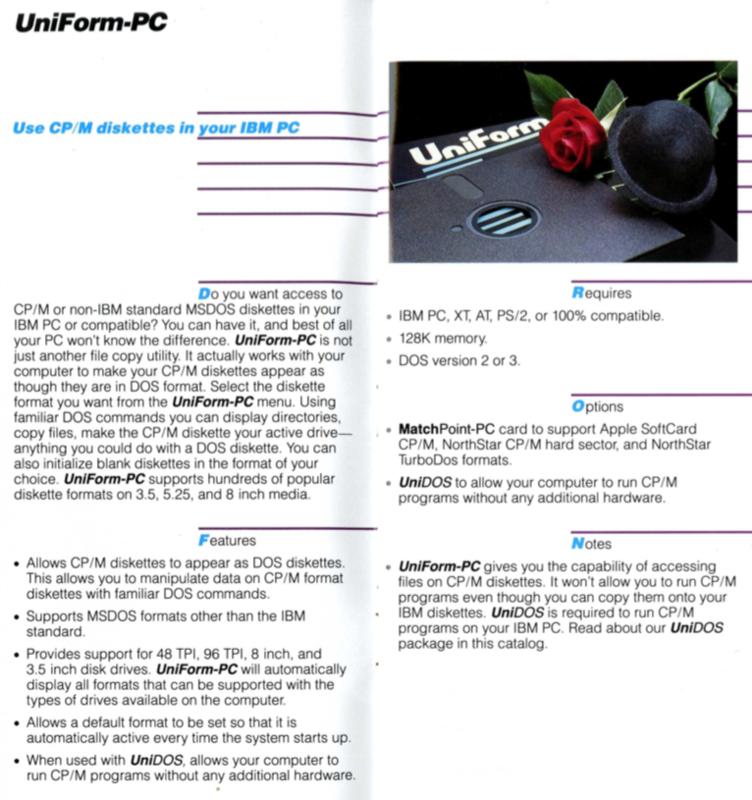 According to a brochure of MicoSolutions "Computer Products" from 1987 the CompatiCard IV is explicitly mentioned with UniForm-PC and CP/M. This UniForm-PC version should therefore be different from the 2.17 version. The strange thing is: The READ.ME file of UniForm-PC 2.17 is from 1989, two years older than the above mentioned brochure. Maybe there have been different UniForm-PC versions for the CC1/CC2 and for the CC4? The CC4 is installed on my IBM PC 5160 as an additional controller and works fine. All additionally connected floppy disk drives can be addressed correctly. There are no problems. The internal port setup of the CC1 and CC2 is very different from the CC4. The CC1 and 2 use their own unique method for setting the data rate; the CC4 uses the PC AT standard that the rest of the world adopted. I've got a late copy of Uniform (ca. 1992) that may support the CC4--I've never checked. So much software, so little time. 22Disk, if my memory is correct, still supports the CC1 and CC2, but you have to call it out in the DISKETTE.CFG file. I had almost thought about the thing with the different internal port setup. Somewhere on the Internet I had already read this. But I don't know where anymore. It may even have been a comment from you! Well then. Thank you for your information. The file DISKETTE.CFG I created in my opinion also correctly. After a long search on the internet I was able to solve the problem. The extended functions (SD/FM, 8inch) of the CompatiCard IV are supported by UniForm-PC from version 3.0X on. The well-known UniForm-PC version 2.17 does NOT support the extended functions of the CompatiCard IV. I'm having trouble understanding why. The CCIV sans BIOS is nothing more than a bog-standard PC AT style controller (uses a NS 8477, just like a lot of 486-style controllers). Are you certain you're not overthinking this? The last article was a little short, so now a little more detailed. Basically this thread is only about the program UniForm-PC and in particular about the interaction with the CompatiCard I, II or IV (CC1, CC2, CC4). In order to use the program Uniform-PC correctly, it must be configured with UINSTALL. And this is exactly where the differences lie. I have three versions of UniForm-PC in use. These are versions 2.05, 2.17 and 3.0. Version 2.05 is described in the User's Guide (First Edition, Oct 1984). For version 2.17 and 3.0 I don't know any manuals. Even after a long search on the internet I found nothing. UniForm-PC 2.05 is configured in the file CONFIG.SYS (DEVICE=UNIFORM.SYS ...) via parameters (see Appendix A). 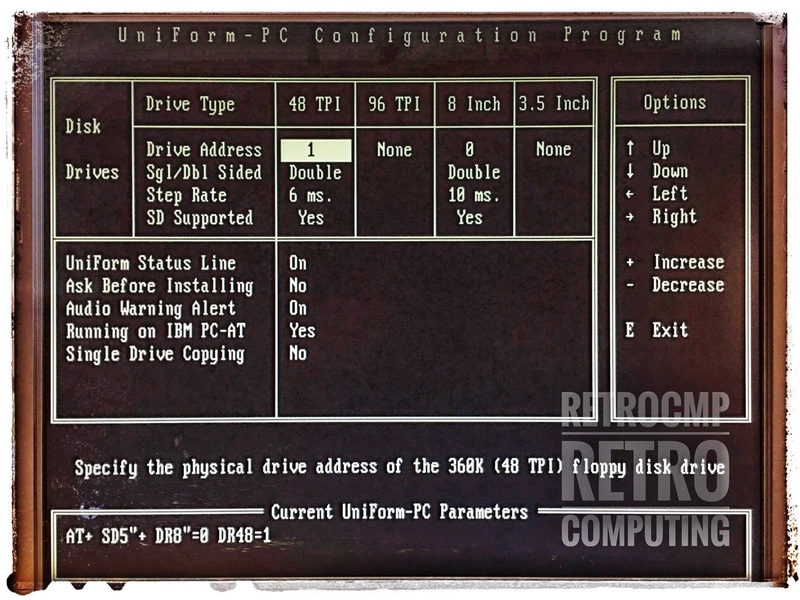 Example: "The SD8" parameter is used to tell UniForm whether your floppy disk Controller supports single density for 8 inch drives. If this flag is true, UniForm will assume that single density will work on your 8 inch drives, and additional formats will appear in the menu". This configuration via parameters is NOT supported anymore in versions 2.17 (ca. 1989) and 3.0 (ca. 1991). Here the installed floppy disk controller must be explicitly selected. With UniForm-PC 2.17 only CC1, CC2 and MatchPoint PC are available besides standard PC/AT. However, CC4 (approx. 1990) cannot be selected because it did not exist at all around 1989. For this reason UniForm-PC 2.17 can basically be used with the CC4, but single density (SD) and 8 inch drives cannot be used, although the CC4 of course supports SD. And in this context, my statement: "The well-known UniForm-PC version 2.17 does NOT support the extended functions of the CC4." is to be understood. The CC4 is of course able to read and write SD and SD (128 Byte/Sector) but not with UniForm-PC 2.17. With the next version UniForm-PC 3.0 (ca. 1991) the CC4 will be supported as well. Here I can explicitly select the CC4 in UINSTALL! I hope that this comment explains the different UniForm-PC versions a little bit better. While I never used Uniform (I have a few copies), why FM is disabled when a standard PC AT controller is selected must be purely a programmer's choice. Perhaps they didn't want to allow any of the competing floppy controller providers into their market. I suspect that it's mostly a matter of a flag somewhere. Certainly, one does nothing different with the FDC other than omitting the MFM bit in the commands. I guess this is where the programmers and the hobbyists part company. As the former, I'd probably take apart the executable and modify it if I had to use it. For this reason I use UniForm-PC version 2.05 on my 386 AT with the SCSI controller AHA-1542B (controller chip DP8473V), because the SD/FM functions can be set with the described parameters. With 22Disk and the CC4 I can also read and write in FM format with the corresponding DISKETTE.CFG file. No problems. Manual: UniForm-PC (2.0X, 1st edition, 1984) / This manual is basically applicable, but it does not describe in detail the later versions anymore. Version 2.1X and 3.0X no longer support the command line parameters! Thats's very impotant, see VCF threat above. --> Part 2: The CompatiCard / Series consisting of three articles.